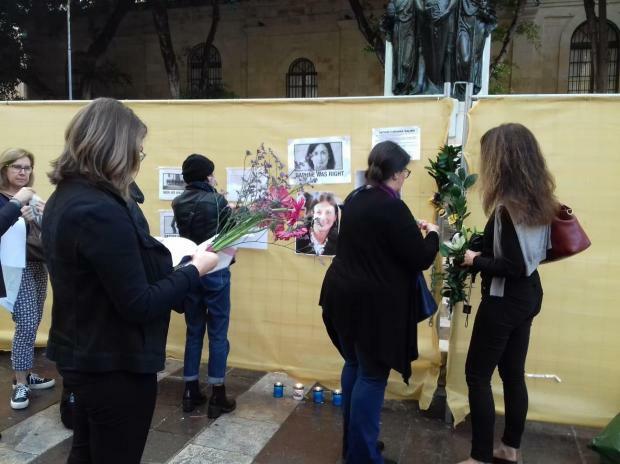 World-renowned author and activist Naomi Klein said on Saturday she has never witnessed such behaviour from the authorities towards a murdered journalist, as she lay flowers at the barricades of the Daphne Caruana Galizia memorial. "Today, I placed flowers and a candle at the now boarded up protest memorial before the law courts. Will the flowers be there tomorrow? The protest memorial has been destroyed – on the orders of the Justice Minister – countless times and has now been completely cordoned off, blocking all protesters who wish to join the call for justice in this case. The authorities seem determined to try to eradicate her memory." Ms Klein delivered the strong statement on behalf of PEN International, the worldwide associate of writers. Invited to Malta as a guest of the Malta Book Festival, she also told a public discussion on Friday that she was disgusted at the way a memorial to the slain journalist was being torn down by the authorities. 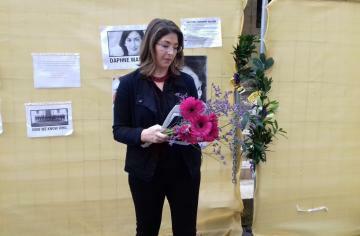 Naomi Klein at the memorial on Saturday. The Great Siege monument in Valletta has doubled up as a memorial to Ms Caruana Galizia since her assassination last year but the tributes have been repeatedly torn down on the pretext that the monument and the surrounding area was being restored. The author of blockbusters like No Logo and The Shock Doctrine said it is worrying that high level officials within the government continue to engage in the vilification of a murdered journalist even after her violent death. Such rhetoric from those in high office fans the flames of hate and encourages a climate of violence towards the media. She said a year ago, the murder of an investigative journalist in the heart of the EU was unthinkable. Yet, in the 12 months that have followed, violence against journalists – particularly those reporting on corruption - has spread across the region, mirroring a worldwide, escalating trend of the free press being attacked with impunity. "This impunity drives a cycle of violence. I know first-hand that an attack on a journalist is an attack on democratic society itself – killing society’s right to be informed and hold the powerful to account. And I also know that impunity emboldens the corrupt, it engenders fear and insecurity, and ultimately it silences the critical voices that are essential to constructing fair, just and safe societies." Prominent subjects of Ms Caruana Galizia’s reporting, who may bear responsibility for her death, have not been placed under formal investigation or questioned and the apparent lack of progress in the investigation into her murder is truly disturbing, Ms Klein said. As a member of PEN, she urged the Maltese authorities to immediately launch a public inquiry to establish whether Daphne Caruana Galizia’s life could have been saved, and, crucially, how to protect other journalists and freedom of expression in Malta. Ms Klein said she was not in Malta to say how the country should run its economy or generate revenue. Sunlight was the best disinfectant, she said. Activists placing flowers at the covered memorial on Saturday.